Our award-winning Backyard Biodiversity project encourages Boroondara residents, especially those living close to our biodiversity corridors, to enhance a section of their garden with indigenous plants and other wildlife-friendly features to create valuable stepping stones for our native wildlife. Since 2010, we’ve run 13 Backyard Biodiversity projects across Boroondara with more than 350 enthusiastic households participating. 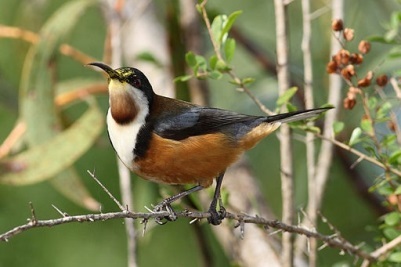 Last year the project targeted the Gardiners Creek corridor and had a special focus on wildlife gardening to attract small native birds (such as the Eastern Spinebill, Superb Fairy Wren and Willie Wagtail). These small birds are less common in Boroondara than they once were. The project inspired and supported residents to enhance their garden with appropriate plants and features to help these birds safely rest and feed as they move across our urban landscape. Following the success of this project and the high level of community interest it generated, this year's project will again focus on creating habitat for small native birds, but will be open to all Boroondara residents. The project is starting in May; to find out more or to join the Backyard Biodiversity project email [email protected] by 12 April 2019. View our Backyard Biodiversity project video to hear residents talk about their experience with the first Backyard Biodiversity project. To stay informed about the Backyard Biodiversity project and our free sustainable living resources, workshops and events, subscribe to Living for our Future e-newsletter.